August 31, 1821, Potsdam Germany, no time given. Died, September 8, 1894, Charlottenburg, Berlin, Germany. Helmholz’s brilliant researches into the exact nature of sound—the science of acoustics, certainly took place on a fifth ray impulse, but his fourth ray sensitivity to perfect pitch, tone and harmony were unusually keen, indicating as well the presence of the fourth ray. A moving body whose motion was not retarded by any resisting force would continue to move to all eternity. A raised weight can produce work, but in doing so it must necessarily sink from its height, and, when it has fallen as deep as it can fall, its gravity remains as before, but it can no longer do work. Accurate experiments have shown that the quantity of heat which is developed by a chemical process - for instance, in burning a pound of pure carbon into carbonic acid - is perfectly constant, whether the combustion is slow or rapid, whether it takes place all at once or by intermediate stages. Now, the external work of man is of the most varied kind as regards the force or ease, the form and rapidity, of the motions used on it, and the kind of work produced. The law in question asserts, that the quantity of force which can be brought into action in the whole of Nature is unchangeable, and can neither be increased nor diminished. These facts no longer permit us to regard heat as a substance, for its quantity is not unchangeable. It can be produced anew from the vis viva of motion destroyed; it can be destroyed, and then produces motion. Water power was the first inorganic force which man learnt to use instead of his own labour or of that of domestic animals. We continually find points of contact and comparison in our conceptions and feelings; we get to know the hidden capacities and desires of the mind, which in the ordinary peaceful course of civilised life remain unawakened. We must rather conclude from this that heat itself is a motion, an internal invisible motion of the smallest elementary particles of bodies. When carbon and oxygen atoms have rushed against each other, the newly-formed particles of carbonic acid must be in the most violent molecular motion - that is, in the motion of heat. You all know how powerful and varied are the effects of which steam engines are capable; with them has really begun the great development of industry which has characterised our century before all others. All that science can achieve is a perfect knowledge and a perfect understanding of the action of natural and moral forces. 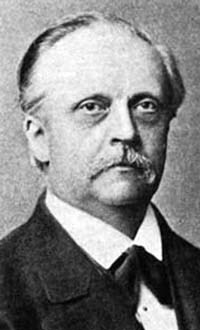 Hermann Ludwig Ferdinand von Helmholtz (August 31, 1821 – September 8, 1894) was a German physician and physicist. In the words of the 1911 Britannica, "his life from first to last was one of devotion to science, and he must be accounted, on intellectual grounds, as one of the foremost men of the 19th century." Helmholtz was the son of the Potsdam Gymnasium headmaster, Ferdinand Helmholtz, who had studied classical philology and philosophy, and who was a close friend of the publisher and philosopher Immanuel Hermann Fichte. Helmholtz's work is influenced by the philosophy of Fichte and Kant. He tried to trace their theories in empirical matters like physiology. As a young man, Helmholtz was interested in natural science, but his father wanted him to study medicine at the Charité because there was financial support for medical students. Helmholtz wrote about many topics ranging from the age of the Earth to the origin of the solar system. His first important scientific achievement, an 1847 physics treatise on the conservation of energy was written in the context of his medical studies and philosophical background. He discovered the principle of conservation of energy while studying muscle metabolism. He tried to demonstrate that no energy is lost in muscle movement, motivated by the implication that there were no vital forces necessary to move a muscle. This was a rejection of the speculative tradition of Naturphilosophie which was at that time a dominant philosophical paradigm in German physiology. Drawing on the earlier work of Sadi Carnot, Émile Clapeyron and James Prescott Joule, he postulated a relationship between mechanics, heat, light, electricity and magnetism by treating them all as manifestations of a single force (energy in modern terms). He published his theories in his book Über die Erhaltung der Kraft (On the Conservation of Force, 1847). Helmholtz is thought to be the first person to put forward the idea of the heat death of the universe in 1854. 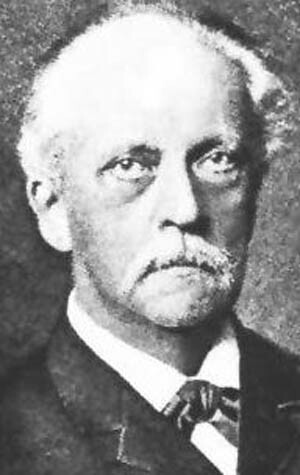 Hermann von Helmholtz's father was August Ferdinand Julius Helmholtz while his mother was Caroline Penn. Hermann was the eldest of his parents four children. His childhood had a strong influence on both his character and his later career. In particular the views on philosophy held by his father restricted Helmholtz's own views. ... the placidity and reserve which marked his character in later life. Hermann attended Potsdam Gymnasium where his father taught philology and classical literature. His interests at school were mainly in physics and he would have liked to have studied that subject at university. The financial position of the family, however, meant that he could only study at university if he received a scholarship. Such financial support was only available for particular topics and Hermann's father persuaded him that he should study medicine which was supported by the government. Given Helmholtz's contributions to mathematics later in his career it would be reasonable to have expected him to have taken mathematics courses at the University of Berlin at this time. However he did not, rather he studied mathematics on his own, reading works by Laplace, Biot and Daniel Bernoulli. He also read philosophy works at this time, particularly the works of Kant. His research career began in 1841 when he began work on his dissertation. He rejected the direction which physiology had been taking which had been based on vital forces which were not physical in nature. Helmholtz strongly argued for founding physiology completely on the principles of physics and chemistry. Helmholtz graduated from the Medical Institute in Berlin in 1843 and was assigned to a military regiment at Potsdam, but spent all his spare time doing research. His work still concentrated, as we remarked above, on showing that muscle force was derived from chemical and physical principles. If some vital force were present, he argued, then perpetual motion would become possible. In 1847 he published his ideas in a very important paper Über die Erhaltung der Kraft which studied the mathematical principles behind the conservation of energy. ... endeavours to ascertain the unknown causes of processes from their visible effects; it seeks to comprehend them according to the laws of causality. ... Theoretical natural science must, therefore, if it is not to rest content with a partial view of the nature of things, take a position in harmony with the present conception of the nature of simple forces and the consequences of this conception. Its task will be completed when the reduction of phenomena to simple forces is completed, and when it can at the same time be proved that the reduction given is the only one possible which the phenomena will permit. He showed that the assumption that work could not continually be produced from nothing led to the conservation of kinetic energy. This principle he then applied to a variety of different situations. He demonstrated that in various situations where energy appears to be lost, it is in fact converted into heat energy. This happens in collisions, expanding gases, muscle contraction, and other situations. The paper looks at a broad number of applications including electrostatics, galvanic phenomena and electrodynamics. The paper is an important contribution and it was quickly seen as such. 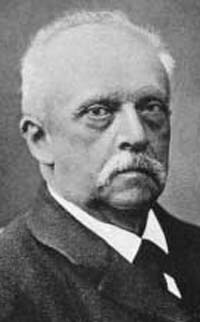 In fact it played a large role in Helmholtz's career for the following year he was released from his obligation to serve as an army doctor so that he could accept the vacant chair of physiology at Königsberg. He married Olga von Velten on 26 August 1849 and settled down to an academic career. On one hand his career progressed rapidly in Königsberg. He published important work on physiological optics and physiological acoustics. He received great acclaim for his invention of the ophthalmoscope in 1851 and rapidly gained a strong international reputation. In 1852 he published important work on physiological optics with his theory of colour vision. However, experiments which he carried out at this time led him to reject Newton's theory of colour. The paper was rightly criticised by Grassmann and Maxwell. Helmholtz was always prepared to admit his mistakes and indeed he did just this three years later when he published new experimental results showing those of his 1852 paper to be incorrect. A visit to Britain in 1853 saw him form an important friendship with William Thomson. However, on the other hand, there were problems in Königsberg. Franz Neumann, the professor of physics in Königsberg was involved in disputes concerning priority with Helmholtz and the cold weather in Königsberg had a bad effect on his wife's delicate health. He requested a move and, in 1855, was appointed to the vacant chair of anatomy and physiology in Bonn. In 1856 he published the first volume of his Handbook of physiological optics, then in 1858 he published his important paper in Crelle's Journal on the motion of a perfect fluid. Helmholtz's paper Über Integrale der hydrodynamischen Gleichungen, welche den Wirbelbewegungen entsprechen began by decomposing the motion of a perfect fluid into translation, rotation and deformation. Helmholtz defined vortex lines as lines coinciding with the local direction of the axis of rotation of the fluid, and vortex tubes as bundles of vortex lines through an infinitesimal element of area. Helmholtz showed that the vortex tubes had to close up and also that the particles in a vortex tube at any given instant would remain in the tube indefinitely so no matter how much the tube was distorted it would retain its shape. If they both have the same direction of rotation they will proceed in the same sense, and the ring in front will enlarge itself and move slower, while the second one will shrink and move faster, if the velocities of translation are not too different, the second will finally reach the first and pass through it. Then the same game will be repeated with the other ring, so the ring will pass alternately one through the other. This paper, highly rigorous in its mathematical approach, did not attract much attention at the time but its impact on the future work by Tait and Thomson was very marked. For details of the impact of this work, particularly Helmholtz's results on vortices, see the article Topology and Scottish mathematical physics. Before the publication of this paper Helmholtz had become unhappy with his new position in Bonn. Part of the problem seemed to revolve round the fact that the chair involved anatomy and complaints were made to the Minister of Education that his lectures on this topic were incompetent. Helmholtz reacted strongly to these criticisms which, he felt, were made by traditionalists who did not understand his new mechanical approach to the subject. It was a somewhat strange position for Helmholtz to be in for he had a very strong reputation as a leading world scientist. When he was offered the chair in Heidelberg in 1857, he did not accept at once however. When further sweeteners were put forward in 1858 to entice him to accept, such as the promise of setting up a new Physiology Institute, Helmholtz agreed. Anna, by whom Helmholtz later had three children, was an attractive, sophisticated woman considerably younger than her husband. 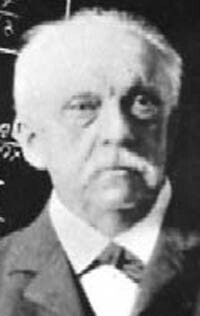 The marriage opened a period of broader social contacts for Helmholtz. Some of his most important work was carried out while he held this post in Heidelberg. He studied mathematical physics and acoustics producing a major study in 1862 which looked at musical theory and the perception of sound. In mathematical appendices he advocated the use of Fourier series. In 1843 Ohm had stated the fundamental principle of physiological acoustics, concerned with the way in which one hears combination tones. Helmholtz explained the origin of music on the basis of his fundamental physiological hypotheses. He formulated a resonance theory of hearing which provided a physiological explanation of Ohm's principle. His contributions to the theory of music are discussed fully in . From around 1866 Helmholtz began to move away from physiology and move more towards physics. When the chair of physics in Berlin became vacant in 1870 he indicated his interest in the position. Kirchhoff was the other main candidate and because he was considered a superior teacher to Helmholtz he was offered the post. However, when Kirchhoff decided not to accept Helmholtz was in a strong position. He was able to negotiate a high salary as well as having Prussia agree to build a new physics institute under Helmholtz control in Berlin. In 1871 he took up this post. In the second half of the 19th century, scientists and philosophers were involved in a heated discussion on the principles of geometry and on the validity of so-called non-Euclidean geometry. ... Helmholtz's research on the subject began between 1867 and 1868. Moving from the observation that our geometric faculties depend on the existence, in nature, of rigid bodies, he presumed he had given a proof that Euclidean geometry was the only one compatible with these bodies, maintaining, at the same time, the empirical, not a priori, origin of geometry. In 1869, after Beltrami's letter ... he realized he had made a mistake: the empirical concept of a rigid body and mathematics alone were not enough to characterize Euclidean geometry. The following year, fully sharing the mathematical itinerary that, through Gauss, Riemann, Lobachevsky and Beltrami, led to the creation of the new geometry, he proposed to spread this knowledge among philosophers while at the same time criticizing the Kantian system. This marked the beginning of a heated philosophical discussion that led Helmholtz in 1878 to try to appease the criticisms of the Kantian a priori. A major topic which occupied Helmholtz after his appointment to Berlin was electrodynamics. He discussed with Weber the compatibility of Weber's electrodynamics with the principle of the conservation of energy. In fact the argument was heated and lasted throughout the 1870s. It was an argument which neither really won and the 1880s saw Maxwell's theory accepted. Helmholtz attempted to give a mechanical foundation to thermodynamics, and he also tried to derive Maxwell's electromagnetic field equations from the least action principle. Helmholtz devoted his life to seeking the great unifying principles underlying nature. His career began with one such principle, that of energy, and concluded with another, that of least action. No less than the idealistic generation before him, he longed to understand the ultimate, subjective sources of knowledge. That longing found expression in his determination to understand the role of the sense organs, as mediators of experience, in the synthesis of knowledge. 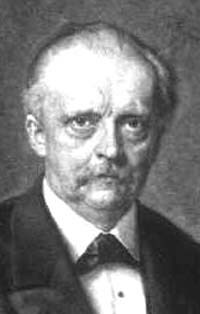 To this continuity with the past Helmholtz and his generation brought two new elements, a profound distaste for metaphysics and an undeviating reliance on mathematics and mechanism. Helmholtz owed the scope and depth characteristic of his greatest work largely to the mathematical and experimental expertise which he brought to science. ... Helmholtz was the last great scholar whose work, in the tradition of Leibniz, embraced all the sciences, as well as philosophy and the fine arts.